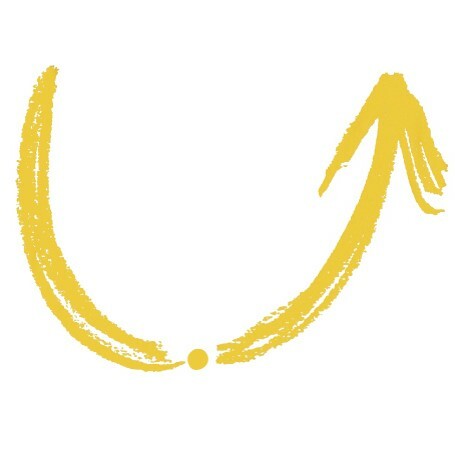 For me, the ‘U Lab’ (sign up at : https://www.edx.org/course/u-lab-transforming-business-society-self-mitx-15-671x) is about offering people ways to lead ‘from an emerging future’ through times of transformation and disruption, bringing to this task an ‘open mind, open heart, open will’. It’s been put together by a group from MIT in America (the same group that well known names in the world of systems change – like Peter Senge – belong to). In a way it U Lab is a crystallization of decades of learning from social and business change movements, and it’s founded on a stark critique of our current economic, social and political thinking that Scharmer calls ‘organised irresponsibility’. At heart, U Lab is an attempt to support and catalyse an emerging community of change makers to step up our impact by paying more attention to how we learn and create new solutions for ourselves, and also together. The first time around, something like 26000 people took part from 126 countries. One of those people was a Director in the Scottish Government (Kenneth Hogg). In his capacity as lead on developing the ‘policy profession’ within the Government, and mindful of First Minister Nicola Sturgeon’s commitment to put participation and community empowerment at the heart of her approach to government, Kenneth thought that U Lab could help. It is focused on better meeting future challenges, it is a participative approach, and focuses on turning actions into real action. He asked members of his team – Angie Meffan-Main and Keira Oliver – to book three dates for ‘warm up’ events in June, July and early September. The idea being to attempt to seed wide interest in the course and in particular to encourage people from all walks of life to host ‘hubs’ – spaces where people could come together for the live sessions… the times when the many thousands of people from around the world tune in together. The second global U Lab ‘MOOC” (Massive Open Online Course) kicks off on September 10th. And on 1st September the team running the MOOC will be in Edinburgh to support an event – the last of three – for people interested in participating. In preparation for this, a team of six people from government, private, third and public sectors have come together to design an event that we intend will build significantly on two previous events. With the event happening in under four weeks and already 250 people signed up, a group comprising volunteers who have attended previous sessions met yesterday to start the design process. At the end of our meeting, we decided to share what we’ve come up with as this blog – to both ‘walk our talk’ about working in transparent ways that are accountable to the wider community now gathering around the U Lab; as a way to record our decisions; and as a way to invite feedback towards creating an event with even more of a buzz than the first two. The first and second events had been led by Kenneth Hogg (Director for Local Government and Communities in the Scottish Government), with support from his team. At the end of the second event Kenneth signaled that he’d like to invite a wider community to take a lead on the next event, and proposed that the third event could have a different, more co-created feel: less about talking from the front, more about sharing what’s happening in relation to this work across Scotland. Before the 3rd July event, about 25 people were invited along to brief Otto and colleagues on the Scottish context to help them ‘tune in’ to where we are at. After the event, this group got an email if anyone might be willing to join a design/hosting team. In addition, a couple of folk had pro-actively offered to help out following the second event. Those who could agree on a date to meet have now become the design team: Debbie Bayne, Peter Ashe, Jenni Inglis, Fiona MacNeil, Karen Lawson, Julie Arts (calling in from Belgium) and myself. We are confident in our ability – together – to come up with something really good; to ‘raise the bar’ : we intend the balance of this event to be much more about those who are coming than those who are on stage. We are a bit worried that someone may come in at the last minute and over-rule our plans; we are therefore keen to have really good communication as well as a clear mandate to get on with this task from both Kenneth as well as our U Lab colleagues (and recognize that Nick and Julie carry important roles in ensuring this). Could/should we introduce elements of the ‘U’ more explicitly this time: practices (the journaling worked well last time) and theory (something around levels of listening? ); might we invite Otto to do this? How can we create a design that can work for people who will be coming with different needs: from newbies feeling fuzzy or without any previous info on U Lab; to people who are signed up, ready to go, and stepping forward as hub hosts? How to steer away from off-putting jargon and language, and steer towards enabling this emerging community to see, enjoy and explore itself – in the context of our common curiosity about the U Lab? 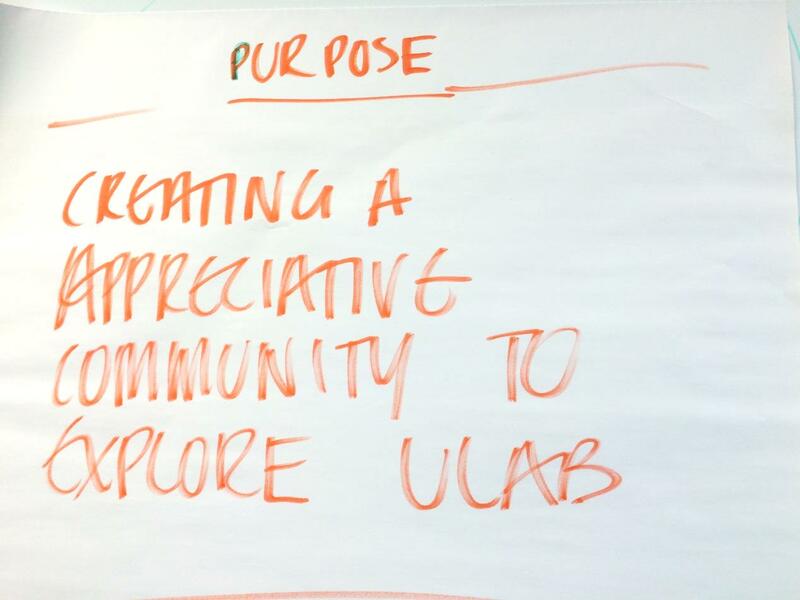 Purpose of 1st September is to create an appreciative community ready to explore U Lab 2.0. So now we’re moving into a ‘prototyping’ phase – coming up with early designs for the event towards agreeing on one to try. Nick agreed to write up this blog, run it by the team (including Julie and Kenneth), then post to the Facebook group and the ULab wordpress site. Nick will also clarify with Kenneth what resources are available to us to run the day (eg from tablecloths to write on to enabling graphic facilitation etc). Fiona agreed to collate and make a proposal for an event design based on everyone’s input by Tuesday. To support the U Lab ‘warm up’ events, Kenneth asked Otto Scharmer if he and his team might be willing to support Scotland to help get the ball rolling. At around the same time, a number of us who had also done the first U Lab met up. We decided to work together to support these events in June, July and on 1st September. The first was to help the group learn from our efforts to spread the word. In an early conversation, several of us talked about being wary of ‘pushing’ something at people. In particular we saw a danger that the U Lab might come across as ‘the next thing’, rather than providing a framework for many existing approaches and tools. We also wanted to make sure that we could walk before we try to run – and not over-sell this prematurely. How might the offer be pitched appropriately to support and build on what we already have? I was also asked to play an interviewer role during the first event to help draw out what the experience of a ‘coaching circle’ was like from some of the folk who’d done this – it was clear from our early conversations that some of the real magic lay in the conversations that the U Lab material inspired between people who had made the effort to come together for the live sessions and more… and we wanted to communicate this. The first two events attracted 180 and 250 people respectively. Each time, there was quite a buzz in the room: it seemed clear that there was much more happening than simply telling people about a new course and I tried to capture this sense in the first two films. Immediately after the second event I was on leave for a week and when I returned Kenneth and Keira had also left on holiday and had proposed that I now work with Julie from Belgium – who works with the global U team – to design/host the third event on September 1st. So I now find myself in the exciting place of supporting a shift of ownership and control towards an emerging ‘U’ community: just the type of work that the government is going to be doing more and more of. At the heart of this is the balancing act of turning up ‘as myself’ to support this shift of power and control; whilst also being a Scottish Government person and all that entails. As we observed in the design group meeting, there is a lot happening around this apparently simple task of designing an event: this is a moment when the nature of government, and how government is done, is changing; and it’s a moment when there is more potential for more of us – as citizens – to step forward to help create the new relationship between citizen and state. Reblogged this on Workforce Scotland. Thanks for this Nick – it’s great to see such an open way of sharing and communicating – setting the expectation for what is to follow in our collective efforts. We’ll have a think about this too around the Youth Orgs Hub we are supporting at Young Scot.